Last week, YY was in town, armed with an itinerary built around food. It’s a good way to travel, if you ask me! Especially in Tokyo, where there is always more food you want to eat than you have stomach space left. 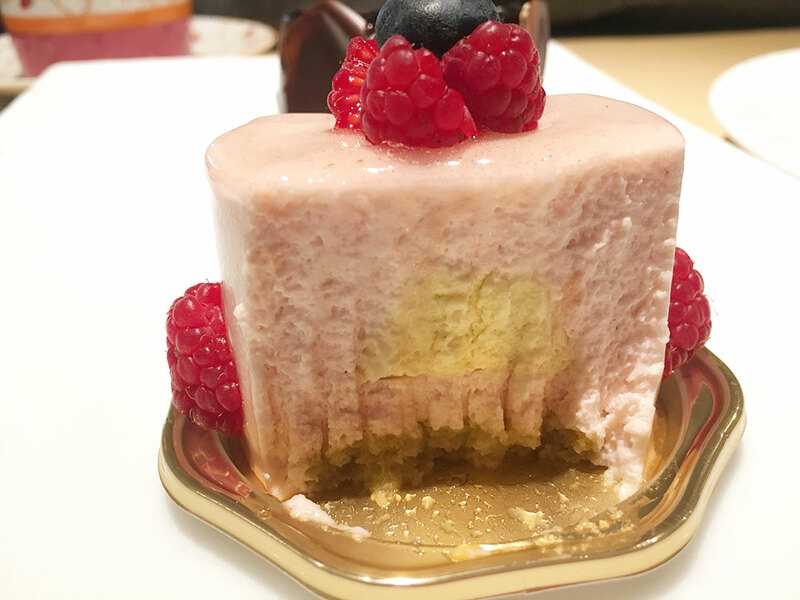 We headed to a patisserie which I’ve never heard of: Hidemi Sugino. Apparently, he is really famous, and was crowned Asia’s Best Pastry Chef last year. 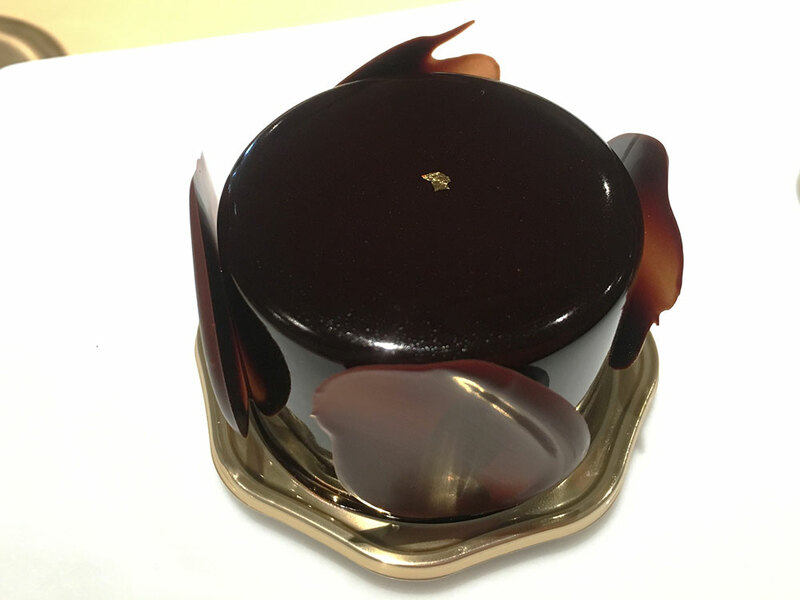 One of his creations, the Ambroisie, won him the La Coupe du Monde de la Pâtisserie, an extremely prestigious award in the world of pastry-making. Only 10 pieces of the Ambroisie is made every day, so in order to secure ourselves a piece, we made plans to arrive before the shop opened. 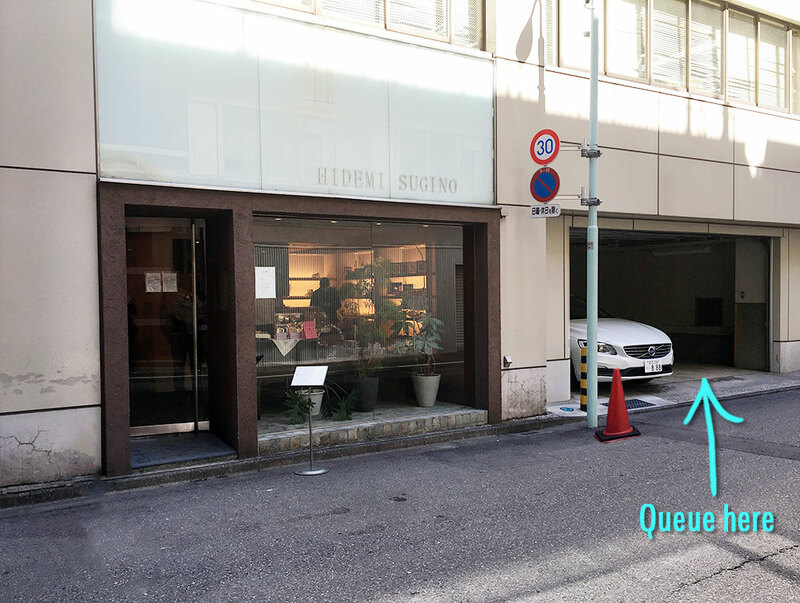 It was a weekday, and arriving at the shop half an hour ahead of it’s 11am opening, I found it devoid of people. I was taking photos of the store front from opposite the road, and the moment I crossed over to peer into the shop, a lady silently materialized beside me and asked if I was queueing. “Um… yes…?” I answered in Japanese, while furtively darting my eyes to the side to check if I was somehow blind enough to miss a gigantic line snaking across the estate. Nope, not that blind yet. “The queue is here”, she gestured, and I followed her into a… garage. Ah… silly me. How could I not have seen it? An absolutely normal cone, with no signs whatsoever, as an indication to show that we are to queue in the garage. Now it all makes perfect sense. NOT. 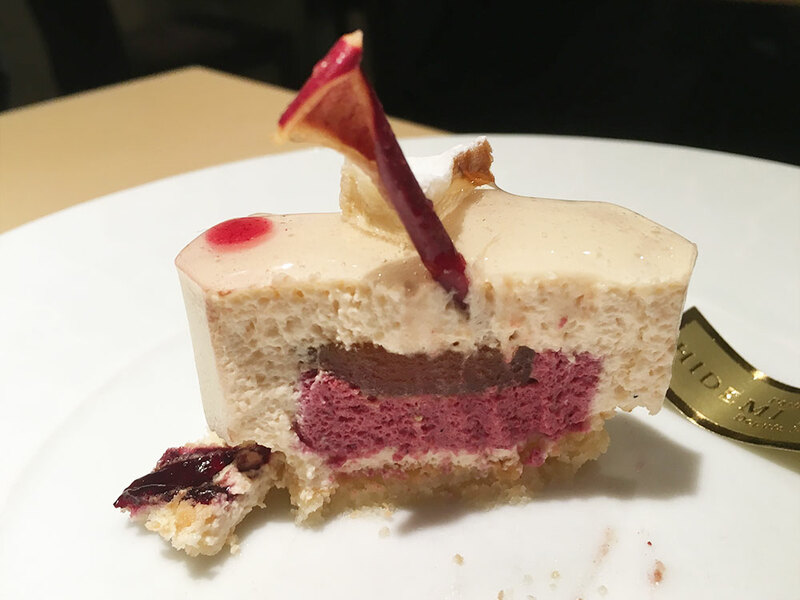 It was also at that exact point in time I decided I had to write this post for all future cake-goers so they won’t have to go through the same feelings of confusion as I did. You’re welcome. I wasn’t the only confuzzled one too, because many people who came after were pacing in the front of the shop while casting curious glances at the little party in the garage. At 11am, the staff came out to invite us in, and by then there were about 10 people in the queue. We quietly filed into the shop and when I laid eyes on the showcase, I found myself panicking slightly. Neat rows of gorgeous cakes, each one looking as delicious as the next. How does one even begin to choose?! We both picked purely based on looks haha! The descriptions were all in Japanese and there simply wasn’t time to examine and deliberate over the cakes, not when I imagine the stares of the others behind must be burning into my back. I did read that Honfleur had apple sake in it, which I thought was interesting! 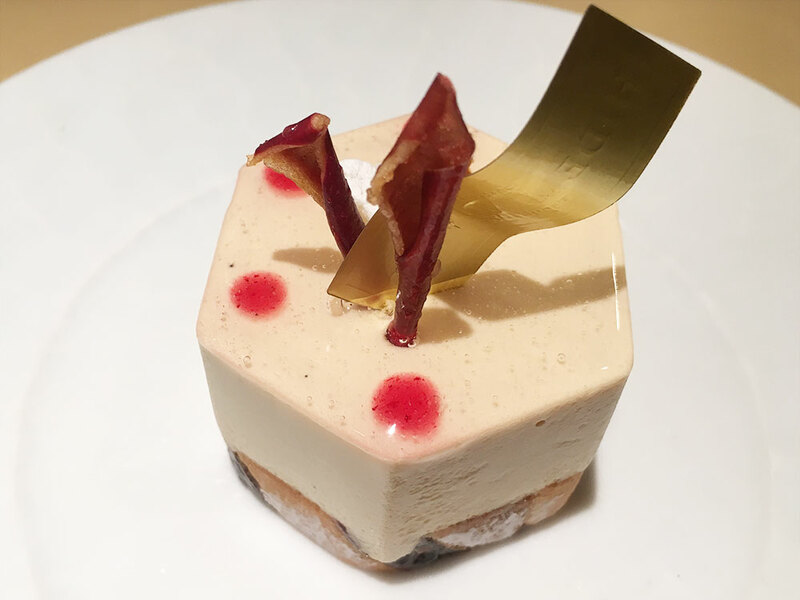 Apple sake mousse with cassis mousse and sautéed apples in the center. Dried apple skin accents on the top. 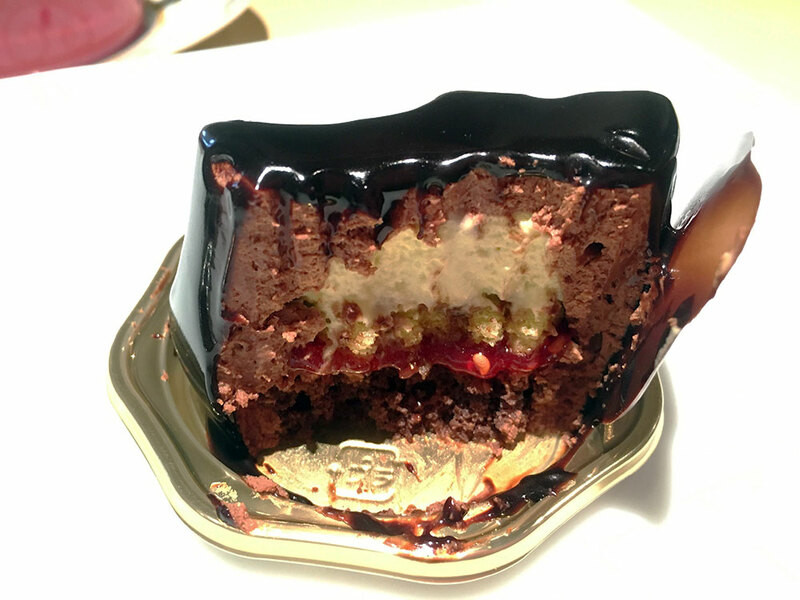 Each of the cakes isn’t very big at all, and will fit comfortably on my palm. Just thought to add this piece of info in because when I showed these photos to my Japanese friends, they were shocked by how small they were. In order of personal preference, I like Marie best because it’s flavorful but so, so light! I could eat this forever. Honfleur packs a powerful alcoholic punch from the first bite. I was quite surprised because I didn’t expect it to be so strong. I think people who drink will appreciate the cake more than I did. It is a definitely unique cake though. 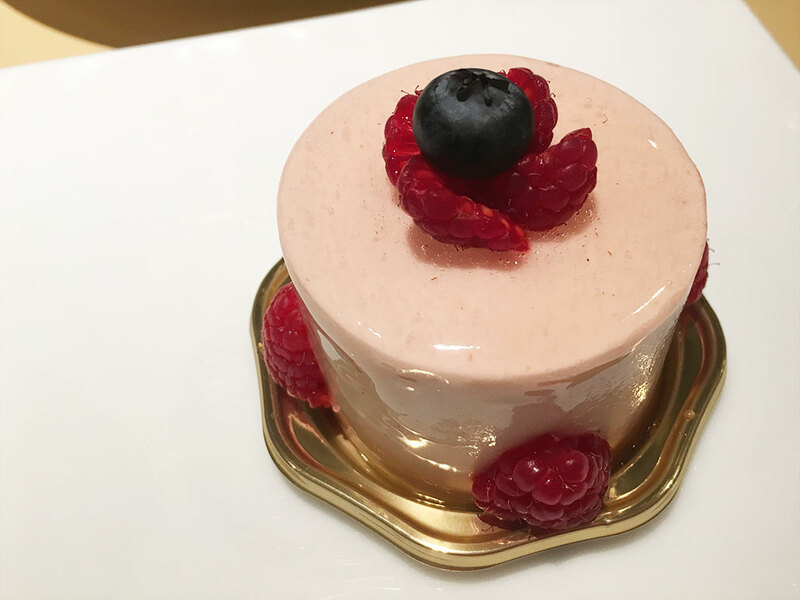 If you like mousse-based cakes, it’s most definitely worth a trip to Hidemi Sugino when you are in Tokyo! Let me know when you finally have a favorite! And you will invite me to your wedding, won’t you? LOL you know I replace James’ face with your face when I see that sticker, right?